In a 2010 article in Wired Magazine, then Secretary of the Department of Energy Stephen Chu suggested that for the world to make progress on carbon emissions, it was most important to create a deal between China and the U.S. Once that occurred, Chu believed that other nations would follow suit. Recently China and the U.S. did announce an agreement on reducing carbon emissions, although further action will be required to move to the strong agreements envisioned by Chu. 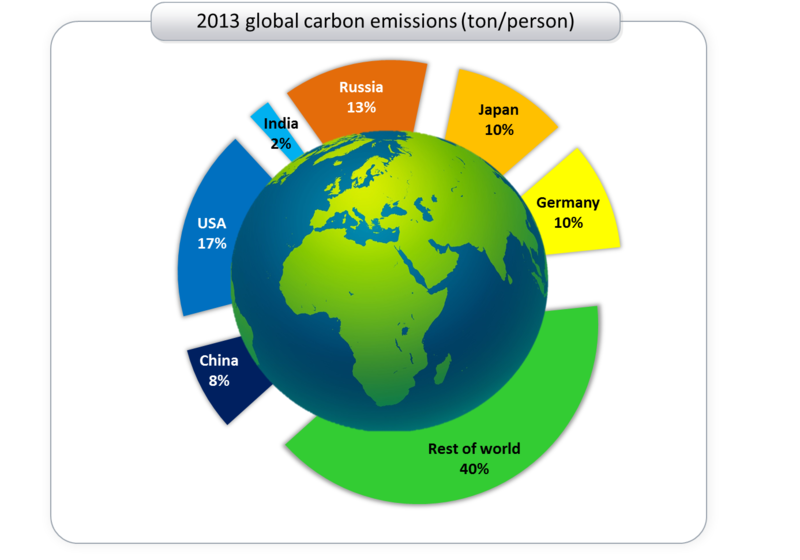 Since 60% of the world’s carbon emissions come from just six countries, we thought it would be useful to take a look at these countries and see where the possibilities may lie for future carbon emissions. China: According to the International Energy Agency, China is expected to double emissions by 2040. 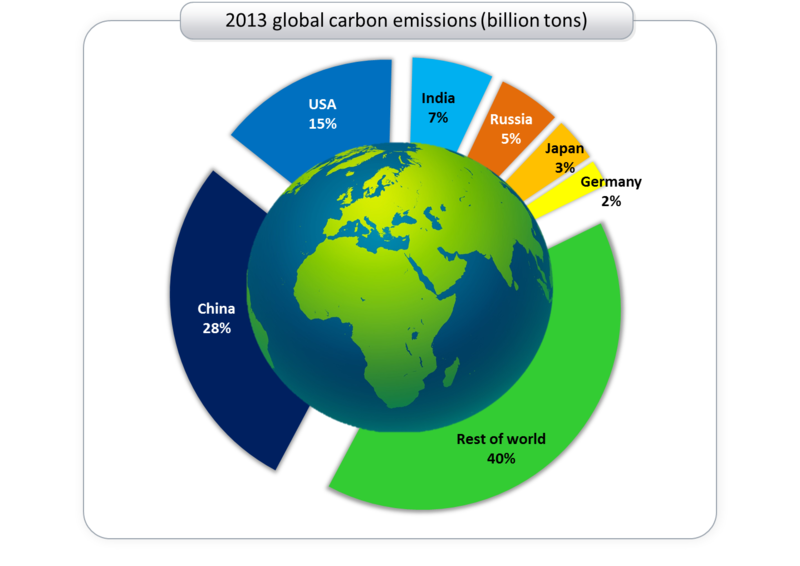 But in the recent agreement with the U.S., China agreed to halt growth of carbon emissions by 2030 and has begun to discuss a cap on the total amount of coal power in the country. It is implementing pilot carbon cap-and-trade programs in limited regions and also is the largest developer of renewable and nuclear power in the world. United States: The U.S. is on pace to meet the Obama administration pledge to reduce emissions from 2005 levels by 17% by 2020. It is committed in the China deal to cut 26-28% from 2005 levels by 2025. Actions for the U.S. to achieve targets are likely to meet strong opposition in the new Congress. Cap-and-trade programs are being implemented in California and nine Northeast states. India: Emissions in India are expected to double by 2030, but the country has made a voluntary commitment to cut emissions by 20-25% relative to 2005 output with targets adjusted relative to economic growth. Russia: Has reduced emissions relative to 1990 by 35% due to decline in economic activity since the fall of the Soviet Union. Has plans for enhancing energy efficiency. Emissions are likely to grow in the future. Japan: Initial more aggressive plans to reduce emissions were stalled by the loss of nuclear power following the 2011 Fukushima disaster. Japan recently announced a goal to trim emissions 3.8% from 2005 levels by 2020, and it implemented a carbon tax in 2012. Germany: Relative to 1990 levels, Germany has reduced carbon emissions by about 25% with a goal to reduce these by 40% by 2020. But emissions have recently started to increase due to substitution of coal for shuttered nuclear units. Germany participates in the European Union Emissions Trading Scheme. The world will get additional insight into where these six countries are going with carbon emissions during the U.N. Climate Change Conference to be held in Paris in December 2015. This entry was posted in Electricity, Renewables and tagged Carbon Emissions, Climate Change, Energy Regulation, Greenhouse Gas Emissions, Nuclear power. Bookmark the permalink.